Growing up in a household where “making do” was a necessity, I have been busy with needle and thread since I was a small girl learning to mend and make clothes and household textiles. In my adult life, I have been a basket weaver and fibre artist engaged in learning techniques, trying out materials and making woven objects. Whether exploring in a museum or gallery or handling an everyday item I catch myself searching out familiar textures, unusual details and useful devices. I am drawn into the rhythm of the weaving and nourished by elegant forms. Woven objects “speak” to me about hands that have held them and people who made them. In 1993 I visited Museum Victoria to meet with anthropologist Alan West, then engaged in a comprehensive study of traditional Tasmanian Aboriginal baskets held in museum collections. Alan led me to a dimly lit storeroom in the depths of the museum and showed me the three Tasmanian Aboriginal baskets in the collection. I donned a pair of white cotton gloves and held one of the baskets in my cupped hands. Already in a state of awe at the privilege of handling this rare and beautifully crafted basket, I noticed something extraordinary! Hanging inside the basket where the weaver left off was the working end of a fibre which had been fashioned into a “needle and thread” used to bind the rim of the basket. This detail, so expressive of the hand that had held it and of the woman who made this basket ‘spoke’ to the weaver in me! I am as excited about it now as I was then, twenty-five years ago. Still haunted by this discovery I returned to Museum Victoria in 1998 and was shown the Tasmanian baskets by Melanie Raburn, Manager of the Indigenous Collections Department. Not knowing which of the baskets I had held five years earlier I examined all three, paying particular attention to the tag ends on the inside. In two of these baskets, the ends are closely clipped or tucked away under the binding. Hanging inside the basket identified as X42740, I found the ‘needle and thread’. I requested photographs of the basket and the detail. Early records and examples of Tasmanian Aboriginal baskets and basket weaving are rare. They have been studied and described by H Ling Roth in the late 1800s, by Alan West in the 1990s and more recently by Julie Gough and the contributors to the 2009 tayenebe: Tasmanian Aboriginal women’s fibre work project, exhibition and catalogue. In his unpublished study for the Tasmanian Museum and Art Gallery (TMAG) Alan West lists thirty-two baskets and in her essay for the tayenebe catalogue, Julie Gough lists thirty-seven baskets which have survived from around the time of European invasion and are held in museums. The basket in question, Basket X42740, came to Museum Victoria via F Schaefer in 1936. It is woven from the leaves of Diplarrena moraea and is twined, as are all but one of the Tasmanian baskets, with an ‘S’ twist. 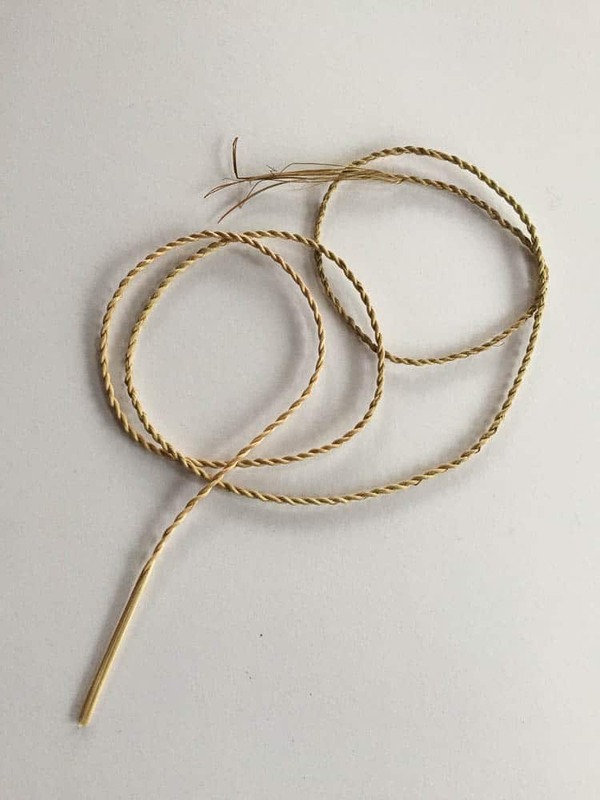 The rim is bound with several lengths of two-ply string and the end of the last of these is left loose inside the basket. This is the working end of a fibre left whole at the base then split in two all the way to the tip, the split part having been spun and plied into string. The result is a flat, blunt, fibre ‘needle’ followed by a length of two-ply string well suited to fit through the narrow slots between ribs and weavers. There is no thickening as at the eye of a separate needle and no necessity to fold the fibre back on itself creating a weakness where it passes through the eye of a needle. 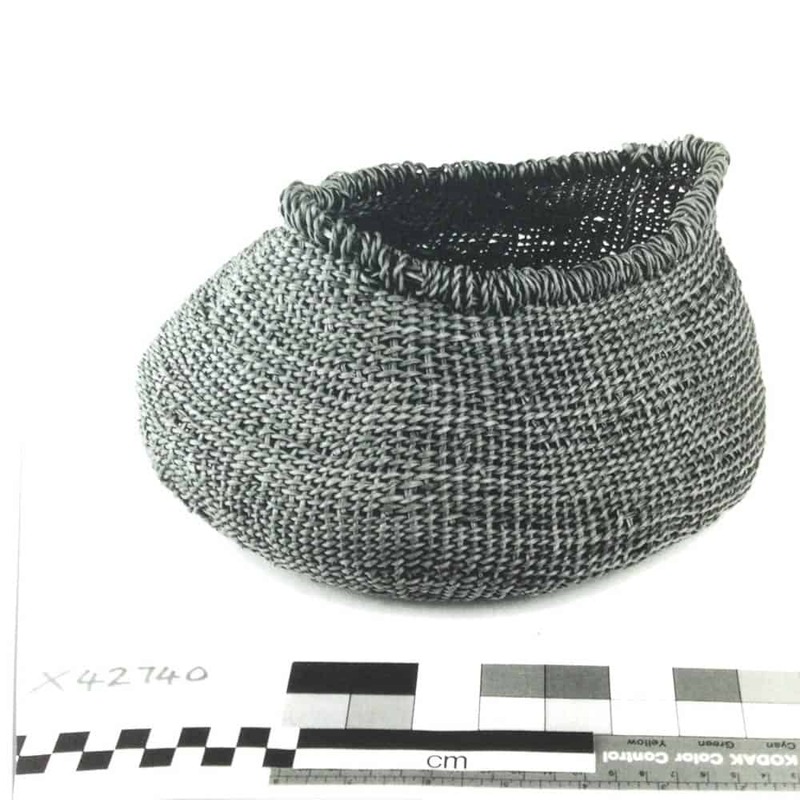 In the early 1990s, TMAG obtained Australian Institute of Aboriginal and Torres Strait Islander Studies (AIASIS) funding to commission a study of the Tasmanian Aboriginal baskets. Alan West, Honorary Curator, MV, conducted a literature search and studied their provenance and construction. Botany Professor W. D. Jackson of the University of Tasmania conducted a study to identify the plants from which the baskets were constructed. A report was finalised in 1996. West made detailed records of the physical properties of the baskets, inspecting and measuring size, weave, handle and rim construction, the methods used to introduce new fibres and the treatment of the finishing ends of warp and weft elements. 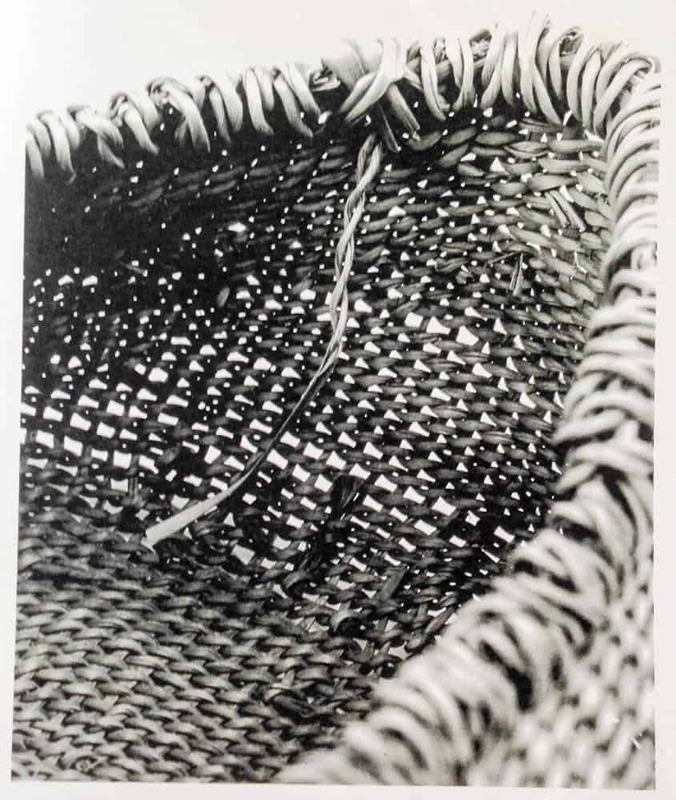 Of particular interest are West’s detailed records of handles and rims on the baskets showing considerable uniformity in the finishing, though there is some variation in the material used to bind rims and make handles. For example, West observes and notes details such as ‘string knotted around the basket suggestive of handle’ or ‘knotted loops inside’. On basket M2731 he notes a 105mm long ‘… extension of the rim binder’. It is surprising that West makes no mention of an extension of the rim binder on Basket X42740. That it has been overlooked suggests to me the value of what the eye of a maker would bring to this study. West does note that this basket has no handle and that both ‘S’ and ‘Z’ twist two ply string have been used in the rim binding. Close scrutiny of the photograph supplied by MV shows the ‘needle and thread’ and that it is made with ‘Z’ twist two ply string and extends about 67mm. Is this ‘needle and thread’ the only example of this device that has survived or are there other examples which have been overlooked? … It shows the moment of disturbance of culture, the space between a pre-colonised past and post-colonised future. This basket came to be in the TMAG collection at an unknown date, from an unknown maker and is unfinished. Formed from Dianella tasmanica, Lomandra longifolia and Diplarrena moraea, this unusual mix suggests that it was made in a hurry from whatever plants were at hand. The reclamation and revitalisation of weaving by Tasmanian Aboriginal women today can be viewed as commencing from the point at which the unfinished basket … was put down or removed, the point at which it was unable to be with its maker or even with another who could or would complete it.’ (Gough 2009, 11, 12). I have been preoccupied with fibre techniques for many years, learning and making use of devices like the half hitch and the ‘god’s eye’ which are present in many different applications, materials and cultures often associated with different meanings and narratives. It seems remarkable to me that I have never come across another example of the ‘needle and thread’ device used to bind the rim of basket X42740. While it is unlikely to be unique it is certainly uncommon. Where else might this invention be found? 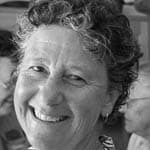 What would it mean to the tayenebe weavers? The ‘needle and thread’ inside Basket X42740 may only have survived because it was overlooked by the weaver herself who failed to remove it when finishing the basket. In her haste, she has left behind a precious piece of instruction for me to find. Gwen Egg is a non-Aboriginal fibre and community artist who lives and works in South East Tasmania. What began as a passion for weaving with natural materials has become, for her, a language with which to explore texture and form in familiar landscapes. Gwen is interested in the ecologies and cultures that inform her understanding of materials and techniques. The process of making stimulates her thinking as do the people she meets through her involvement in community arts and teaching. Egg, G., 2001, ‘Weaving Familiar Territory’ in Textile, No. 6, 31-32 TAFTA, Brisbane. Roth, H.L., 1899, The Aborigines of Tasmania, Fullers Bookshop (Faxcimile of Second Edition), Hobart. West, A.L., (finalised) 1996, Tasmanian Aboriginal Baskets, 1993/94 Research Project for the Tasmanian Museum and Art Gallery, Hobart (Unpublished document). the practice of making a needle from the tip of the working strand is also practiced in South America . the spike on the agave leaf becomes a working tool. with the strand of the fibre directly attached.. It is a strong and handy item which lasts the length of the strand then anohter is created from the next thorn. I was gifted one many years ago. Hello! and thank you Nalda. I have seen a picture of the agave needle and thread and made one. Is this sisal? It is a very similar concept. Are the fibres sometimes spun while attached to the needle/tip?